Early in May, a friend and I went to Cape May in search of migrating warblers. First stop: Cape May Point State Park. 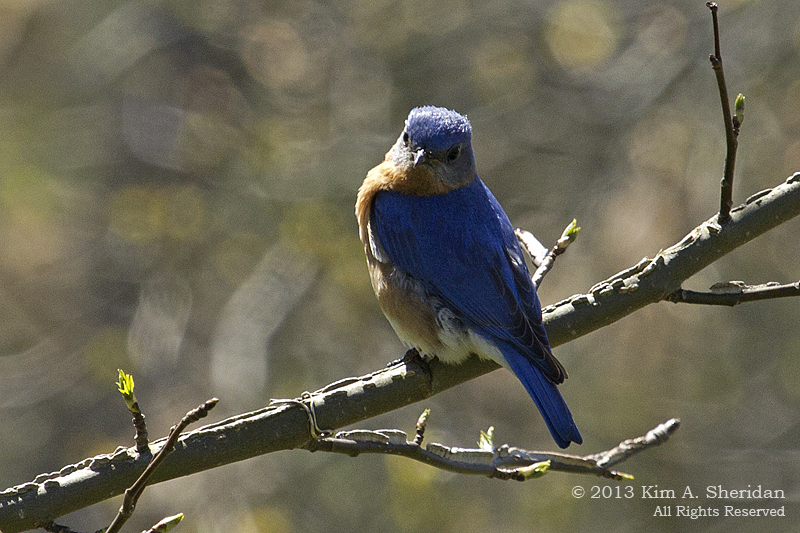 Surprisingly, we had no luck in the warbler department, although we got this obliging Eastern Bluebird to pose for us. Our next stop was Higbee Beach WMA, along the Delaware Bayshore. This is a wonderfully confusing tangle of woods, meadows, dune scrub and beach. We got lost at least twice. 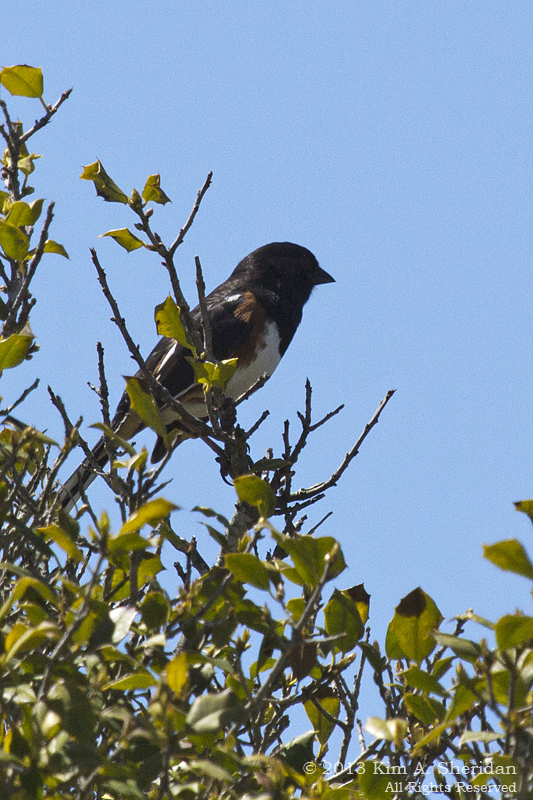 It was worth it though, as we did find the warblers we’d been seeking, as well as this Eastern Towhee (above). 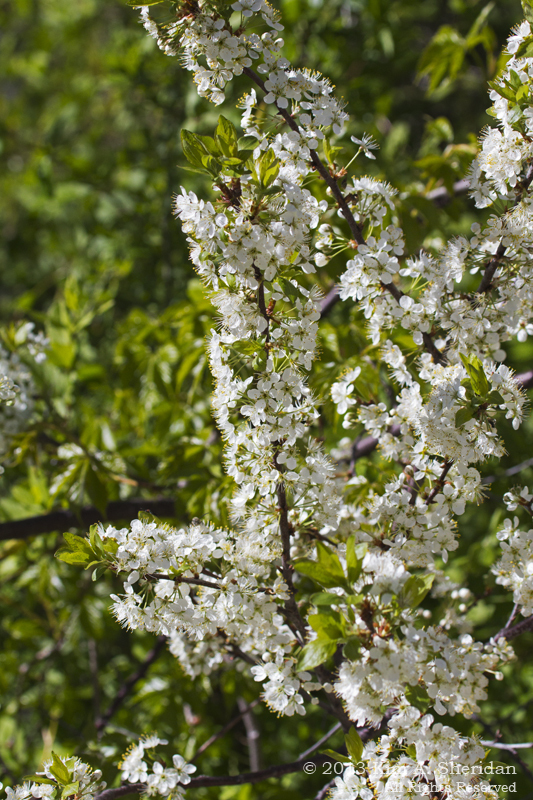 Flowering trees drew swarms of bees, but I was more bothered by the jumbo mosquitos. Some of them were bigger than the birds! Next up: Thompson’s Beach, further north along Delaware Bay. 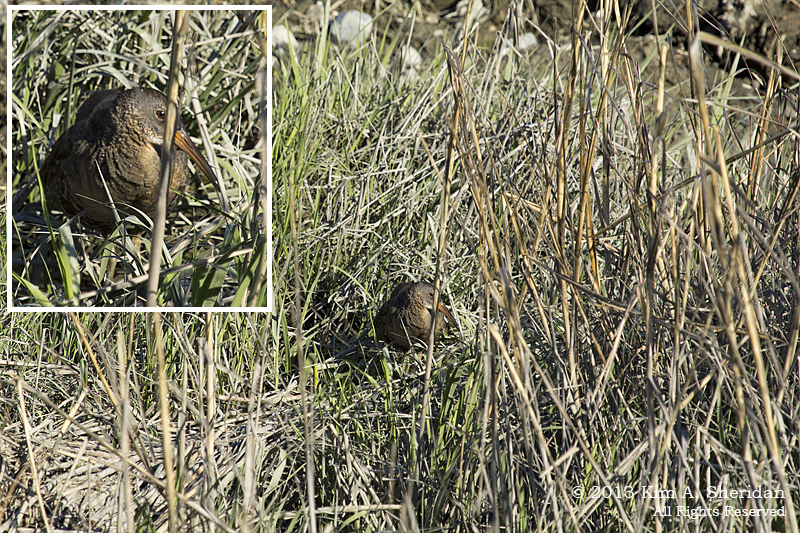 Our sole purpose here was to see the elusive Clapper Rail. We searched first from the observation deck at the end of the road, then took a long walk out to the beach and back. For the duration of our trek we could hear the constant laughing call of the bird, but we didn’t spot a single Rail. Finally back at the deck we saw one, who gave us a good look while he was preening. Imagine my joy when my camera suddenly declared “Card Full”… Fortunately I came away with one good shot. Here you can see why they’re so hard to find (above). Not only do they blend in so well, they are usually are deep in the grass. Our last port-of-call was Matt’s Landing Road at Heislerville WMA. 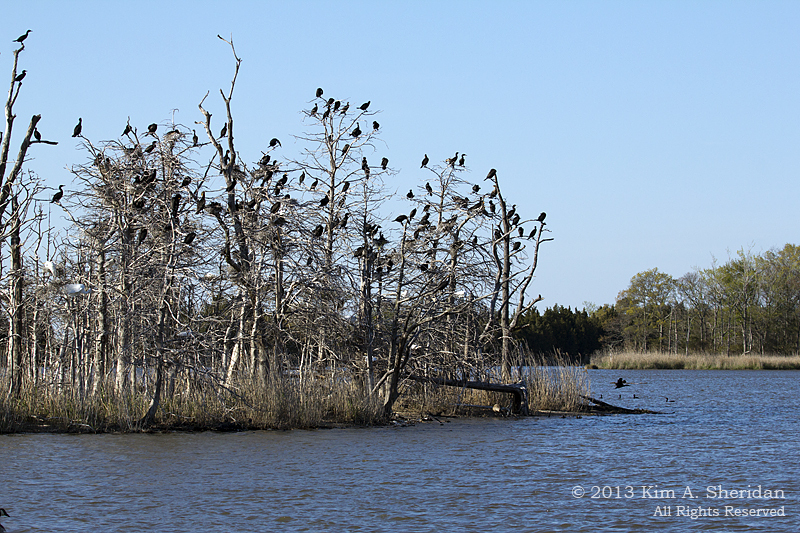 There’s an island there covered with trees – and Cormorants. 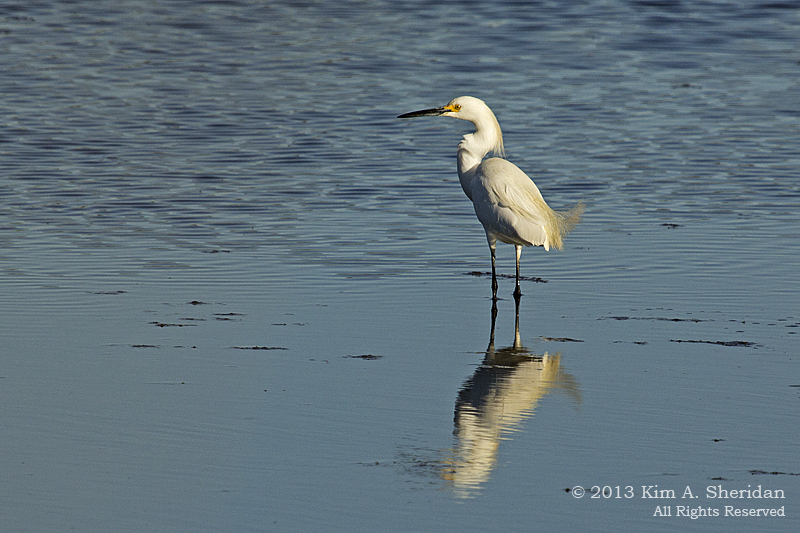 And Egrets. And Herons… Basically it’s a rookery, a place for birds to roost and nest. I was happy not to be too close – I can only imagine the smell. 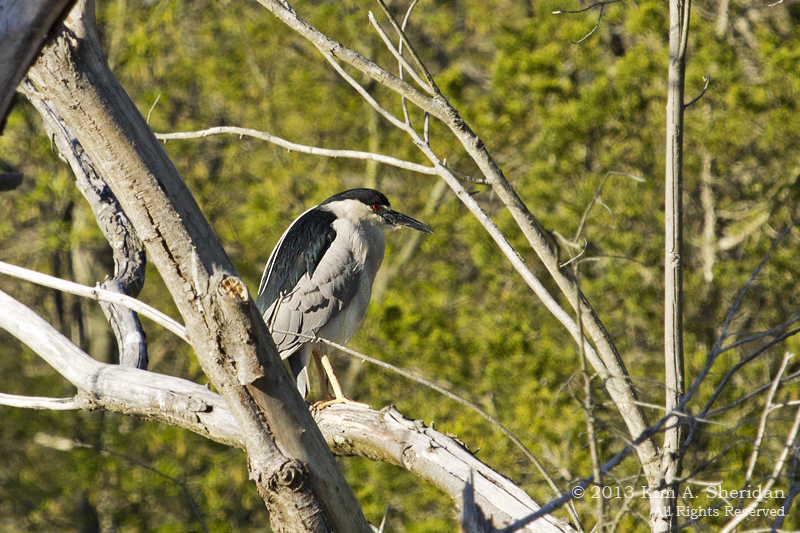 On the drive around the impoundment we spotted this Black-crowned Night Heron (above) in a tree, and a Snowy Egret in the wonderful evening light. 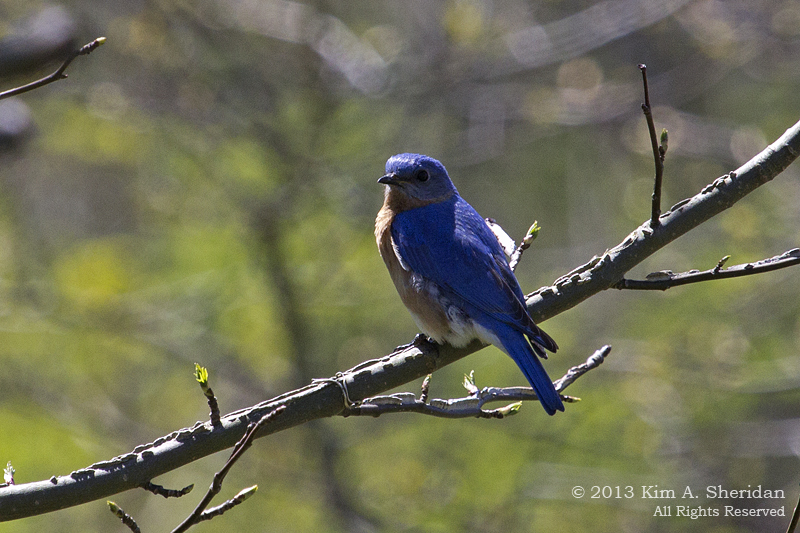 FUN FACT: The male Eastern Bluebird chooses the nest site, in tree cavities or nest boxes. He entices the female to nest there by displaying and carrying nesting material in and out of the hole. That’s it! The rest is up to her – building the nest, and incubating the eggs. She keeps him around though, as pair bonds last for several seasons. A male will defend his nest sites against any bird he considers a threat, so maybe he’s good for something after all! This entry was posted in Birds, Flowers Trees & Shrubs, Jersey Shore, Nature and tagged Birds, Cape May Point State Park, Flowers Trees & Shrubs, Heislerville WMA, Higbee Beach WMA, Thompsons Beach by Kim. Bookmark the permalink.